Sadly, those who "occupied" Wall Street and city squares across the country in 2011, were right: All of the income gains have concentrated at the top, while the rest of us saw a deterioration or stagnation in our wages and income. We can’t seem to stop having record numbers of people living in poverty in the United States. 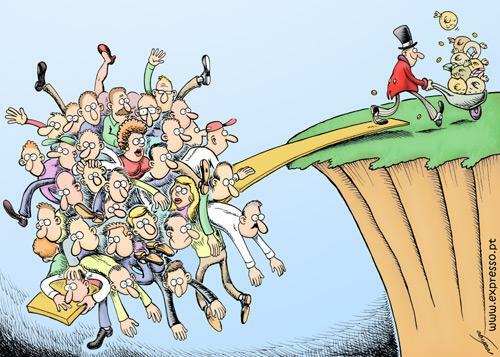 The richest continue to get richer and the rest of us continue to see our incomes get lower and lower. New Census Bureau figures released only days ago, show that 15 percent of the U.S. population lived in poverty in 2011. Over 46 million Americans lived at or below the poverty threshold of a household income of $23,201 per year for a family of four. One in five of our children live in poverty and over one-third of black and Latino children are struggling through impoverishment. In 2011, we saw the first one-year increase in income inequality since 1993. The top 5 percent gained 5.3 percent in income in 2011 over 2010. The lowest quintile saw little change, but the second-lowest, middle, and fourth-lowest quintiles all experienced a decline in income over the year. Sadly, those who “occupied” Wall Street and city squares across the country in 2011, were right: All of the income gains have concentrated at the top, while the rest of us saw a deterioration or stagnation in our wages and income. This data also confirms that safety programs work. According to the Census Bureau, unemployment benefits kept 2.3 million of us out of poverty in 2011, Social Security benefits kept over 21 million people out of poverty and, if we count the nutrition aid of the Food Stamps program as income, it would show that 3.9 million people were lifted above the poverty line in 2011. Increasingly, all of the boost in wealth is concentrated at the top and record numbers of poverty persist, while the middle and lower-economic classes are losing ground. Now is not the time to lower taxes on the wealthiest by cutting proven, effective anti-poverty measures such as Unemployment Insurance, Supplemental Nutrition Assistance, the Earned Income Tax Credit, Social Security, and new coverage benefits gained from the health care reform law. The rich shouldn't be rewarded while the rest of struggle.